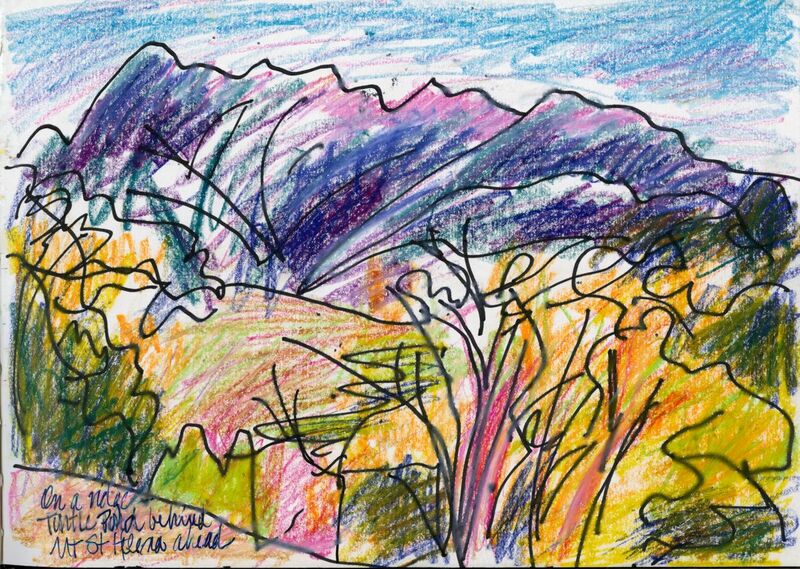 A Santa Rosa Junior College faculty research grant from the Pepperwood Foundation to study nearby Pepperwood Preserve as artist in residence, through my own practice of drawing and painting, re-ignited my passion for working en plein air. (En plein air is French for painting and drawing directly on location in the landscape.) I committed also to teach at Pepperwood, and to tell and show the story of the place and of my investigations and artistic journey. Sometimes collaborating with biologists, earth scientists, anthropologists, astronomers, historians, photographers, and stewards of the land, I discovered our mutual commitment to research and teaching through deep observation and to sharing the joy and solace we find in nature. My approach is painterly — images form through movements of the brush, growing like grass, sweeping like wind. I sometimes build atmospheric perspective in color, with more vivid color and contrast in the foreground plane, more blue-gray in the distance, but sometimes I choose a modernist or contemporary tack of flattening distance by keeping color values and intensities similar, cropping in unexpected ways, or using expressive or arbitrary color. Here is a gallery of some of my Pepperwood paintings. Click on any one to enlarge and also to view a slide show of all of the images and titles. When I take a photo, Mt. St. Helena shrinks in proportion to everything in front of her, but that’s not how I experience it. 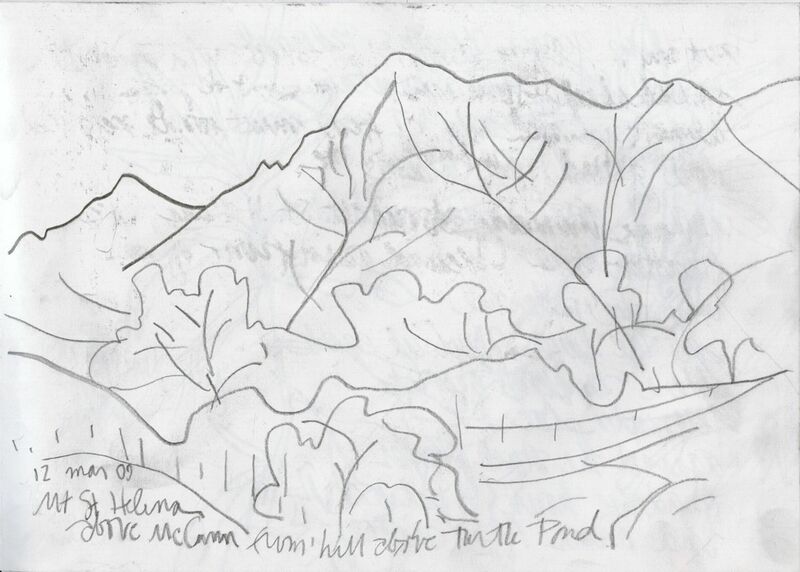 My sketchbook and canvas are too small by acres—the Preserve is over 3000 acres!—but the drawings and paintings express how the mountain fills my visual field and holds my attention and awareness, even when it is hidden from direct view. I meditate on artists and their special relationship with mountains of their own region. Cézanne made over 60 paintings of his “Mont Sainte-Victoire” in Province. I often call Mount Saint Helena my Mont St. Victoire. Georgia O’Keeffe called the Pedernal her mountain. Many years ago we were sure we’d found her house down a Ghost Ranch dirt road, when a view of the Pedernal and the layers of colored earth, like rainbow sherbet, fell into place against the stark shapes of cactus arms in the patio of an adobe house. And Hiroshige and Hokusai’s extraordinary woodcut series about ways of seeing, 36 and 100 views of Mt Fuji, informed Impressionists and Post-Impressionists, and inspires dialogues with artists today, more than 100 years into a future they couldn’t foresee, after Japan had been closed to the West for 200 years.